After wandering the labyrinthine corridors of the Atelierhaus Mengerzeile in Berlin's Treptow district for quite some time, I finally find my way to the spacious studio of Enda O'Donoghue (born 1973 in Limerick, Ireland) where a wonderful reception awaits me: a mug of strong tea and biscuits served on a tiny table, in the background the music of Scotland's Malcolm Middleton, probably one of the best songwriters of our times — even if, not unlike the pearls of the Berlin art scene, the world doesn't seem quite ready for him yet. This is the perfect setting for a contemplative exchange on Enda's artwork — as perfect as the presentation of his large-scale paintings, all 2.40 metres wide and 1.80 metres tall that are propped on blocks along the studio's four long walls for our perusal. And, in particular, as perfectly intriguing as the painting itself — incredible, positively uncanny, how countless mosaic-like sections, abstract if taken on their own, combine to create an overall motif. All overlaid with the scent and charm of oil paint that transports the motifs into another time and dimension. The rain patters against the windowpanes, our talk turns to the structures of his pictures, and we note a shared fascination with the timelessness of painting. 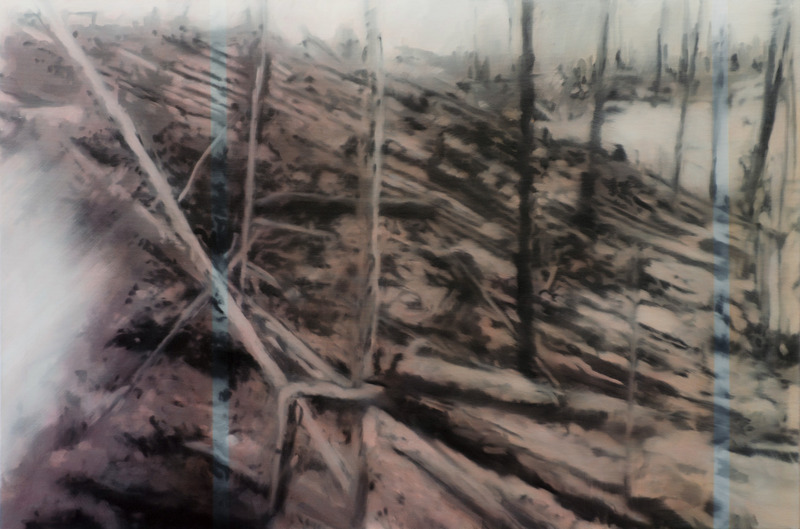 Or, to be more precise, with the power of oils to move us into a sphere of simultaneity that can only exist within painting, causing us to forget everything around us, even the rainy Berlin summer. We talk about Reno, the first picture of Enda's I saw, last year, that made me want to meet him immediately. 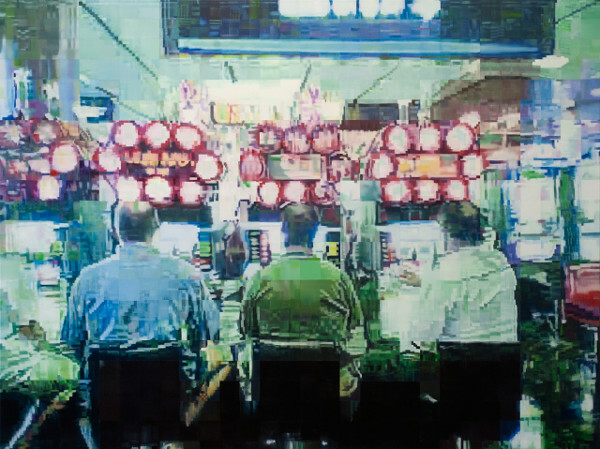 It shows an unfocussed image of three men, their backs to us, in some kind of casino. They appear motionless, frozen — and lost in the picture's unifying structure of geometrical fragments, merging with the vague, banal space from which they barely stand out. 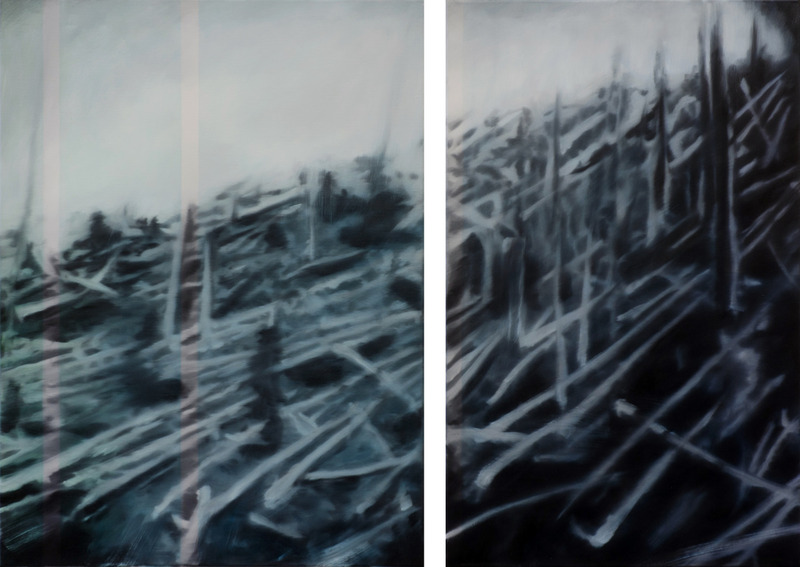 From Reno we move on, in a new work entitled Artificial Light, to a funfair and the dodgems. Here, too, the abstract quality is astonishing: the complementary colours blue and orange-red vying for a life of their own, independent of the motif; the use of blurring, heightened by countless reflections; the displacement of time in the form of competing painted particles; and the shimmering atmosphere that holds the picture together. Still at the funfair, my gaze shifts to the tentacles of a carousel, the Octopus of the picture's title, rising out of the sky that dominates the frame. This picture, too, conspicuously lacks a centre, focussing the viewer's gaze on a sky generated out of geometrical forms. 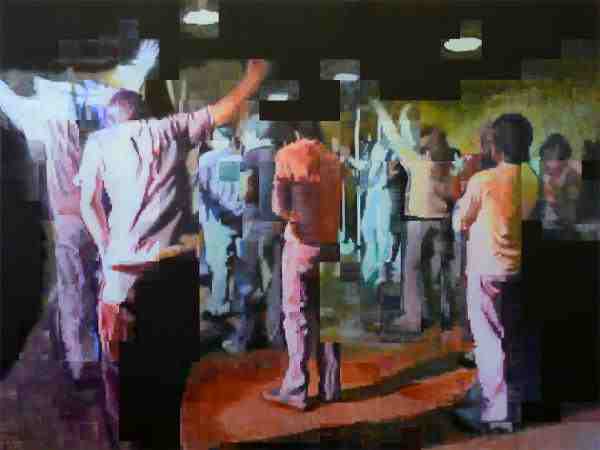 To understand the mathematical colour coding of Enda's works, we look at a canvas he is currently working on: the source, a photograph of a group of people seemingly engaged in a spiritual dance, is translated into squares of colour, with the framing of the scene in tones of black already apparent. Once the picture is finished, this abstract play of colours will shift the presence of the motif into a placeless state of timelessness and illusion. Enda takes his motifs from image files discarded in the placeless Internet. He researches the origins of each individual picture and brings the photograph back to the surface of the world. 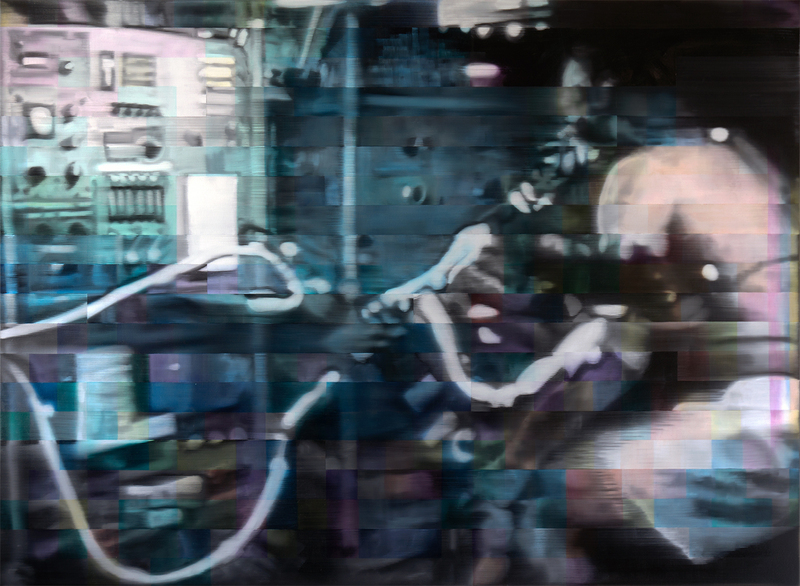 Once the original owner's permission has been granted, it then serves as the basis for a super-sized retrieval on canvas. This procedure is typical of Enda's astonishing capacity for turning things on their heads. Life amidst the flood of digital images is commonly associated with a lack of boundaries and the struggle to assert oneself against the torrents of banality. In terms of Andy Warhol's prophecy that "everyone will be famous for fifteen minutes", a picture and its creator today are only relevant for fractions of a second. High time, then, for this whole process to return to the slowness, dignity and weightlessness of oil painting. By adopting this approach, Enda holds a highly reflective mirror up to our age and brings the spirit of the times, often absent even from contemporary art, back into the picture.